In addition to the online store, we have our very own shop, in a renovated former barn in rural Juupajoki, Finland. We are open Monday-Friday from 9 Am until 3 Pm. Call us to schedule a time outside the regular hours. 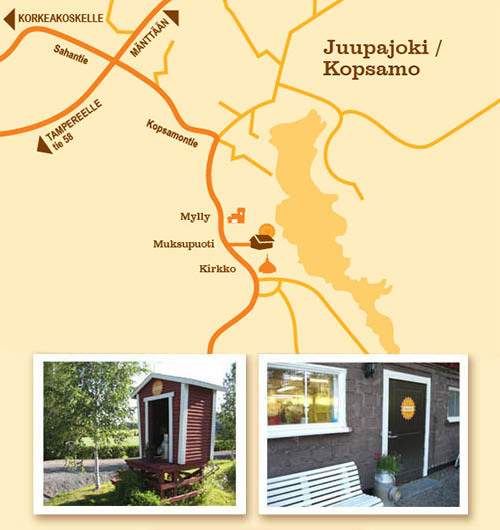 Once you find Kopsamontie in Juupajoki, drive until you reach the intersection. Turn right, passing the grocery store. After the bend, you'll see a flour mill on the left. Right after, you'll see a yellow house, that's us. Turn to the drive at the red milk pier, and you're almost there! The store is located in the barn, see the signs on the door. We will be so happy to see you!